As I type this, Hurricane Sandy is pinwheeling its way across the East Coast. All day long I’ve been haunting Facebook and fretting. I have friends and family scattered up and down the Eastern seaboard, and they’ve all spent the past several hours hunkered in their houses, waiting for the storm to come bellowing in. I’ve seen periodic updates of torrential waters in the streets, winds pushing over upright bodies, power going out in home after home after home. I’m sure the news reports are massaged for maximum eye-widening effect, but still. I’m knocking wood for everyone’s safety. I’m also noticing something. As my friends spent the day settling in, an awful lot of them cooked. My Facebook feed was peppered with photographs of bubbling pots, a cheery reminder that people still had electricity and fuel. A theme emerged: soup and stew. I saw potatoes and mushrooms and vegetable pot pie and squash. I guess when a hurricane is throwing up walls of water just offshore, it makes sense to arm yourself with a bowl of something steamy and life-giving. So in solidarity with my housebound loved ones, tonight I’m staying in and making good old-fashioned butternut squash soup. I came up with this recipe as a teenager, and it’s one of the few I make the same way every time: with with sauteed leeks, a parsnip, a sweet potato, and a Granny Smith apple. The first time I made this, I impulsively splashed in the dregs from a bottle of Cognac, and it ended up being exactly what the soup needed: a boozy zing to cut the rich sweetness of the squash. I’ve tried it since with plain old brandy, which is just as good as Cognac (and a whole lot cheaper), but my poison of choice these days is bourbon, which gives a shiver of smokiness that I love. The soup is just fine without the liquor, but on a day like today, I’d say it’s needed. This is the kind of soup I crave when I’ve had a bad day: silky and soft, perfect for sipping from a mug whenever the weather is foul–as it most certainly is now for my East Coaster friends. Here’s hoping the storm spends itself soon, and life can clamber quickly back up to normal for all of you. I’m not a big bread baker. It just doesn’t tickle my fancy much. 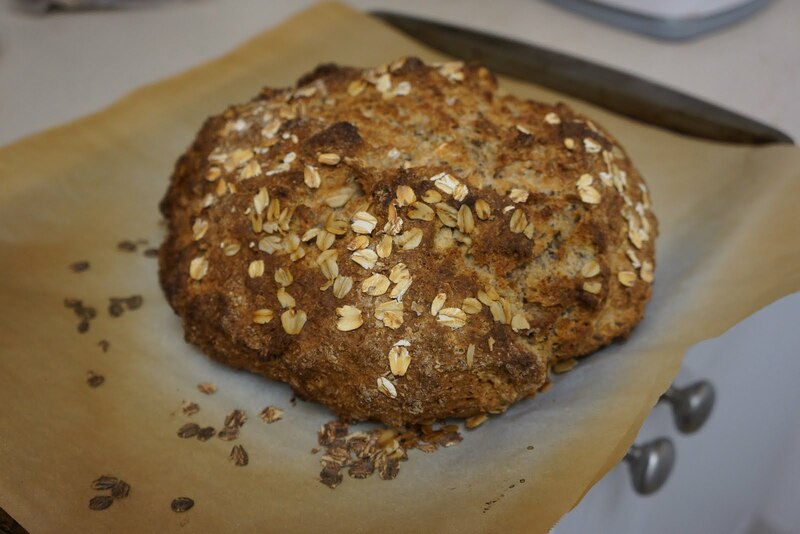 But last weekend I tried my hand at Irish soda bread, and now I’m on my second loaf in seven days. This is serious business. I love a good whole-wheat loaf, and this one might be my favorite yet. It’s dense and chewy, with just enough white flour to give it a soft fluffy crumb.The sturdy crust growls oh-so-satisfyingly under a bread knife, revealing a plush, almost cakelike interior. The flavor is deep and gruff and wheaty, shot through with flax and oats and the licorice tang of whole caraway seeds. It really makes anything you’re eating with it feel like a good square meal. And since it’s a quickbread, there’s no kneading or rising involved–the dough comes together in minutes, and goes from mixing bowl to cutting board in under an hour. There are two options for baking this bread: in a loaf pan, or rounded on a baking sheet. I’ve tried them both; the spongy middle turns out identical, but the crust is astonishingly different. The loaf pan produces a lighter bread, with a crackly-crisp crust on the top only. This would be a terrific breakfast bread, ideal for slathering with butter and jam. The round loaf, meanwhile, is crusty all around: the top is jagged and crunchy, and the bottom is solid like an artisan loaf. I’ve never had a crust this solid and satisfying on a whole wheat bread before. As an accompaniment to a thick winter stew or a hearty vegetable soup, I’m not sure it can be beat. This bread is at its absolute best warm from the oven. As it cools, it loses a lot of its belly-warming charm. Once that happens, the only fix is the toaster oven–but it’s a good one. Toasting this bread restores some of that wonderful all-over crispness, and heightens the nuttiness and sweetness of the bread itself. A toasted slice of this bread is almost as satisfying as an oven-fresh one, with a thin shaggy crunch giving way to fluffy insides. My personal favorite M.O.? Freeze leftover slices–no more than an inch thick, please–and toast them straight from the freezer. Oh, and though I’m not a beer drinker, I have it on good authority that this bread is The Thing to have with a glass of Irish stout. If you try it, please report back. My apartment has a gas stove. It’s an elderly beast, with a rust-pocked metal surface and dials straight out of the 1980’s. The burner covers aren’t anchored to the surface at all, so they slide around, propping pots at rakish angles and sometimes slipping completely off a lit burner. The cooktop doesn’t light reliably, and sometimes it doesn’t even try to; once or twice, in the middle of a cooking project, it’s decided that it’s had enough, and tucked away the little blue flames so quietly that I didn’t notice. But still, I forgive it, because when it’s in the mood to cooperate, that stove can roast a mean red pepper. Nevermind that my apartment smells like burning for two days afterward. Roasting peppers is just too much fun when you have a gas stove. I love setting the pepper at an angle over the ring of flame, watching the skin slowly blacken and flake up into ember-edged bits. I love the little jolt I get whenever an ember shakes loose from the skin and skates across the stovetop. And I love the ending ritual, once all the sides have been seared: steaming the pepper, then crumbling the blackened bits off to reveal supple red flesh underneath. Broiling and grilling will get the job done on a pepper, but for sheer primal MAN MAKE FIRE satisfaction, there’s nothing like an open flame. The last time I roasted a red pepper, I had to borrow a match and a candle from another tenant just to light the stove. 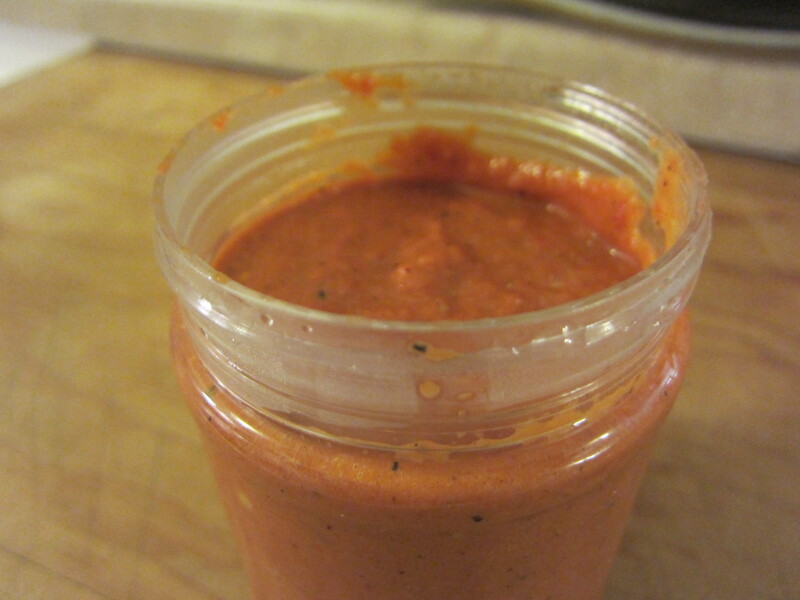 But it was worth it, because at the end of it all, I had a batch of homemade harissa. I first discovered this stuff in Israel, drizzled into a falafel sandwich: a thick orange-red hot sauce, bulked out with roasted pepper and fragrant with garlic and spices. You can buy it in jars, fiery and pungent, but I was surprised by how different my homemade version tasted: less aggressive, sweeter and lighter, unmistakably roasted, with spices lingering in the background rather than charging the stage. In the week since I’ve made it, I’ve already used it in place of salsa on huevos rancheros, and stirred it into a batch of minty tomato sauce for poaching eggs. At this rate, I’ll be lucky if it lasts another week. One thing to note: harissa recipes vary, but most agree that it should be aggressively spicy. 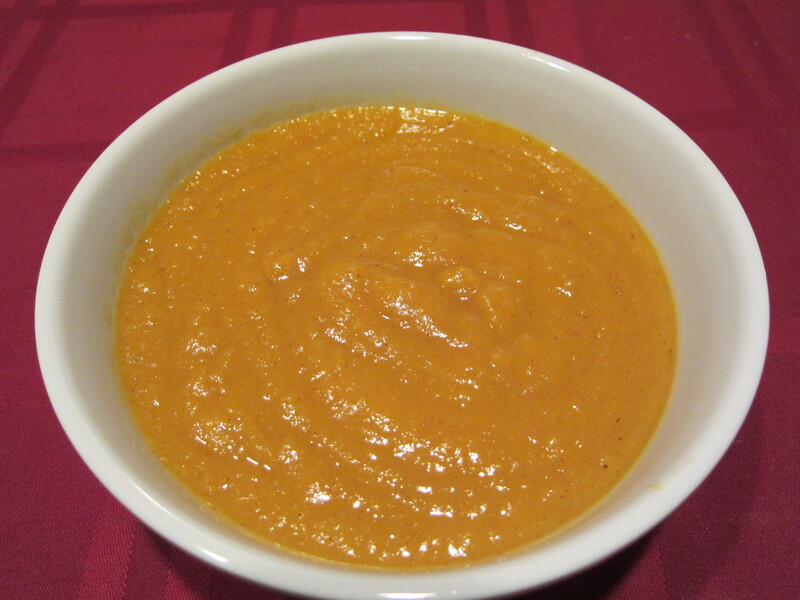 Perhaps it’s just my pepper-blitzed taste buds, but the recipe I adapted was not nearly spicy enough for my tastes. This version is a sweet-smoky red pepper paste, almost like a salsa–but a hot sauce, it ain’t. Next time I think I’ll swap a habanero for the Fresno chiles–but me, I like a fair amount of heat. Your mileage will almost certainly vary. I love improvising in the kitchen. But lately I’ve been doing less and less of it. Part of it is distraction: there’s a universe’s worth of recipes out there, and most of the time I’m just chasing them around, like a child with a jar in a firefly swarm. Part of it is laziness, the temptation to just follow someone else’s breadcrumbs rather than start a new trail myself. Part of it is a hunger to learn new techniques and tricks, which I can only practice by trying what someone else already knows inside and out. But there’s also a big pinch of self-doubt, and an awful lot of inertia. I find myself listening more and more to the perfectionism-goblin, who’s diabolically skillful at talking me out of things. My creative well feels low and muddy these days, for both food and writing; he’s always right there to stir the muck at the bottom for me, to let me see for myself that there’s nothing left. Using someone else’s recipes is safe, comforting, an easy way to keep the goblin satisfied. So I’ve found myself doing more meticulous planning, and less aimless riffing. Which is a shame, because it’s usually the aimless riffing that yields the most exciting results. Like the addictively flavorful salmon salad I made not long ago. I’d bought a brick of smoked salmon for a lunch party, but there was a riot of other food on the table and it went quietly uneaten. Two weeks went by, and I felt guilty for leaving it in the fridge, alone and unloved. I could have just flaked it onto some dark bread with mustard and called it a day–in fact, I was sorely tempted–but something in the back of my mind said, Come on. Try something different. You haven’t played in a while. 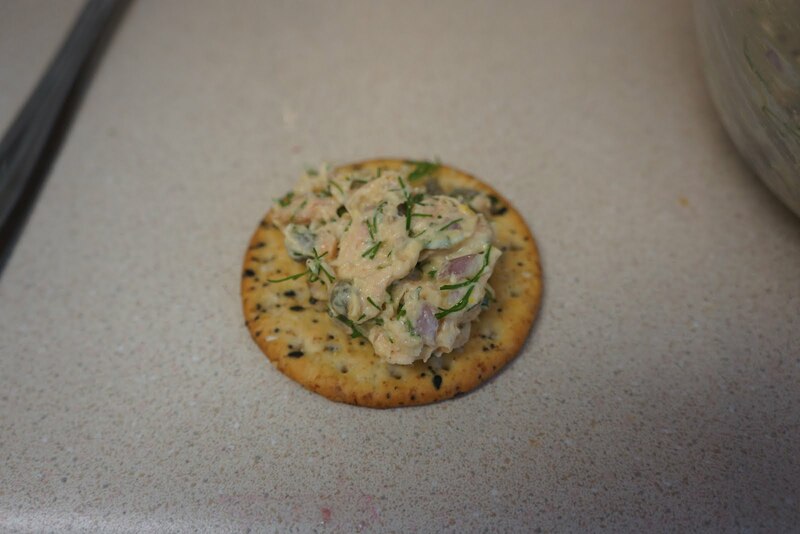 So I gathered up all the traditional trappings of a good salmon dish: mustard, dill, capers, lemon, shallot, and cream. I mashed them all together in a bowl with a mound of flaked salmon, then opened a box of crackers and called some friends over for snacks. While I waited for them, I took a taste–then a bigger taste–then said to hell with it and started heaping salad onto crackers for myself. It was perfection in a bowl, tangy and salty and rich and just a little zippy, like a brunch platter you could eat with a spoon. It’s the kind of totally improvised dish I will be making again, and again, and again–perfectionism be damned. It’s not okay that a newspaper feature writer has written a piece about how untoned upper arms are repulsive. It’s not okay that she’s couched it in terms of aging, hanging her loathing on her own over-50 frame and describing the loosening of her muscle tone as a steady drumbeat of doom that began in her young-and-lithe 20’s. It’s not okay that she pushes away all the other equally rotten “uglies” and “lumpies” and “too bigs” and “too smalls” that ring in our ears–cheekbones, collarbones, breasts, shoulders, backs, waists, hips, buttocks, thighs, calves, ankles, toes–to inform us that having flabby triceps is really the most irredeemable offense of all. It’s not okay that she’s calling out a famous woman whose physical trademark is her arms, writing about her in all-too-familiar words drenched with shame and loathing, insisting that, like other physically blessed women, she should shroud her enviable and hard-won assets because she’s making others jealous. It’s not okay that her public figure of choice is Michelle Obama, whose body and fashion choices have been magnified and scrutinized and rubbed raw in the media, because she’s a sturdily built black woman in a feminine figurehead role. It’s not okay that she’s picking on Michelle Obama, whose signature campaign–however flawed it may be–has always been couched in terms of health and physical fitness, not beauty. And it’s not okay that this whole business is being published in one of America’s newspapers of record–the Gray Lady herself–the New York Times. I hate that this happens. I hate that it’s profitable. I hate that it’s normal. I hate that it gets to me.